Upstart Crow Bookstore and Coffee House - A San Diego Gem! 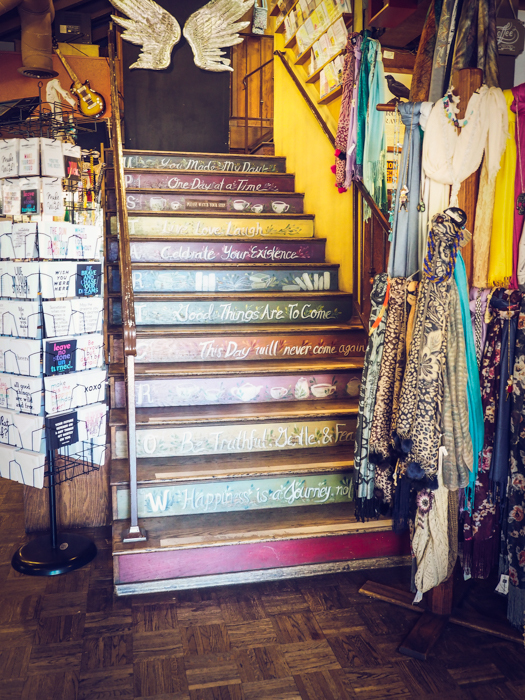 Upstart Crow Bookstore and Coffee House – A San Diego Gem! Our trip to San Diego was a bit of a surprise – at least for me and the kids, and so was the Upstart Crow Bookstore and Coffee House. Mark was headed out for a Podcasting conference, and we decided it might be fun to head out early with the kids since I had never been. Because of the short notice, we didn’t have much planned out – except for a day at DisneyLand, and a day at the San Diego Zoo. The rest of the time was set aside for roaming about and enjoying the cool San Diego weather. We were going to figure things out once we got there. Where is Upstart Crow Bookstore and Coffee House? 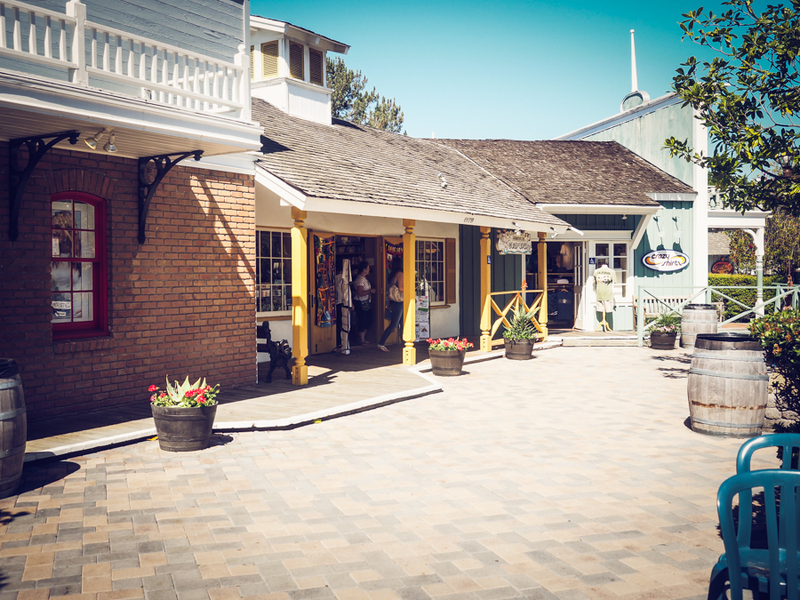 Just one of the many small “streets” you can wander up and down at Seaport Village. It was during one of our unscheduled times that we stumbled upon Seaport Village, located at 849 West Harbor Drive in San Diego. 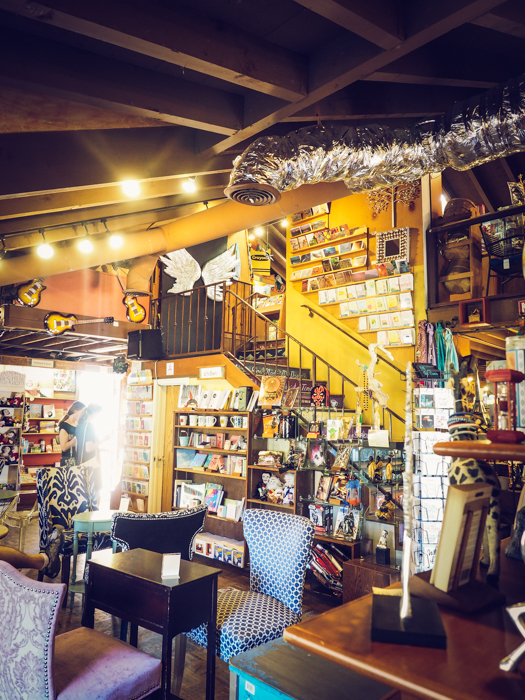 It was just down the street from our hotel, and as we were roaming around very excited about our discovery of this place and all the cute stores and snack shops surrounding us, we saw Upstart Crow Bookstore and Coffee House. There were many cute stores in Seaport Village. They had a magic shop, a candy shop, a few restaurants, and many stores with some wonderful knick-knacks – – you know – the kind that make great gifts for the family and friends you left at home. Once I caught a glimpse of Upstart Crow Bookstore and Coffee House, I immediately knew I had to go in and check the place out. I’m always on the hunt for the perfect bookstore. We don’t have a small, local bookstore where I live, so this is always a treat to find one in the cities I visit. Since we were almost at full-blown meltdown, I sent Mark and the kids on their merry way to buy a trinket and a snack while I happily perused the aisles of this boutique type bookstore all alone (a rare occurrence). Can’t you just picture yourself sitting here in front of the bookstore with a nice cup of coffee and a new book? What caught my eye first was the small patio on the front of the store. There was an older gentleman enjoying a cup of coffee while he read the newspaper. And in the background, there were birds chirping, and the sound of waves crashing on the nearby shore. Like a dream… And of course, it was San Diego, so it was about 75 degrees with a nice cool breeze coming off the ocean. I mean look at those stairs…I saw those and just had to go up them. And waiting upstairs for me was a sweet little children’s area. It made me want to sit down and read some books and play Chinese checkers on the little table they had set up. I roamed happily about for an hour or two, and then I got a text from my husband saying they were ready to grab some dinner. My dream was coming to an end. So I quickly grabbed a few books off the shelf, purchased them, and headed out the door. As I was leaving, I realized that the store had such an interesting name. Not what I would have chosen for my bookstore, but it made me think…and wonder. What did this name mean? If you only saw the word “Upstart,” I’m not sure I’d associate that with a cute little bookstore and coffee house. This still didn’t make total sense to me, so I looked around to see what an “upstart crow” actually was?? I also found many sites referring to Greene’s hatred toward other actors. He considered them parasites and mere puppets. Wow…he sounds really angry to me. And the reference to a “tiger’s heart wrapped in a player’s hide” is said to be a reference to one of Shakespeare’s first plays, Henry VI where you read “O tiger’s heart wrapped in a woman’s hide!” Hmmm…leaves me wondering about Mr. Greene. I don’t know anything about him – I had never heard of him until I began writing this blog post. But William Shakespeare – yes…I’ve heard of him. Even read many of his plays. So…in my mind, Shakespeare wins. If you’re a fan of William Shakespeare, there is a ton of information about him all over the Internet. I found a site that I liked called Poets.org. You can click on the name and it will take you straight the the page on their website dedicated to William Shakespeare. Lots of good information about him here, including links to most of his works. If you look up the word upstart in the dictionary, you will find the following: (n) 1. a person who has risen suddenly from a humble position to wealth, power, or a position of consequence. 2. a presumptuous and objectionable person who has so risen; parvenu. And then of course, to crow means: (v) 1. to gloat, boast, or exult (often followed by over). So many gifts and books to look at. And scattered throughout the bookstore are little quaint tables with mis-matched chairs to sit in while you browse through books and enjoy your cup of coffee. How Can I Read More About This Bookstore & Coffee House? So…on to more exciting stuff. 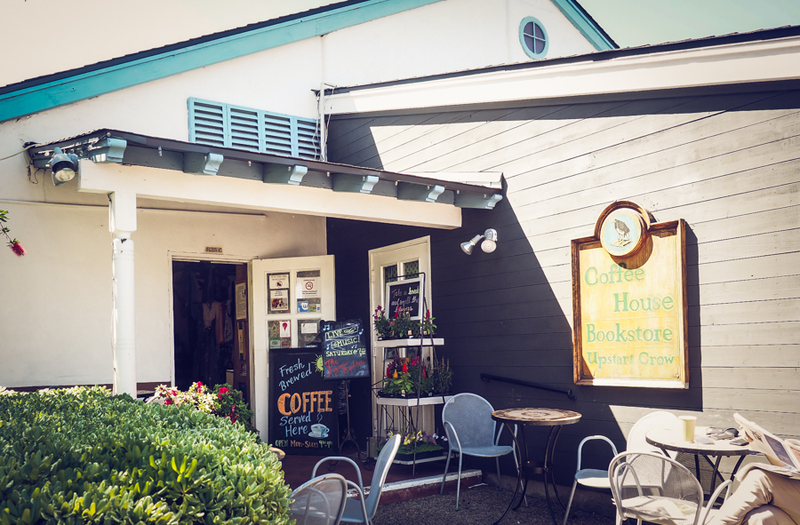 You can read all about this little bookstore on their website by just clicking on the name: Upstart Crow Bookstore and Coffee House. They describe themselves as being filled with hundreds of interesting and unusual gifts, wonderful books, and of course, the fine aroma of freshly-brewed coffee. The atmosphere is inviting and comfortable. Our staff is friendly and helpful; good service is our specialty. After roaming the aisles of this neat little place, I would agree with all of this. What is Their Coffee Like?? Roaming the aisles and looking at the books and gifts was wonderful, but I still feel like I’m missing out sometimes because I don’t drink coffee. Apparently, their coffee is quite tasty! And guess what…you can buy it off of their website. How does a nice bag of Upstart Crow Whole Bean Gourmet Coffee sound? To me, it sounds disgusting, but to you coffee connoisseurs, I bet it sounds delicious! Also on their website, you will see that on the first Tuesday of each month, they have Shakespeare Open Readings, which is described as an informal evening with the Bard, starring you! All welcome. Free. Anyone can join in the reading or just come along to listen. Parts are re-assigned before each scene so everyone who wants to can read. Oh my…no thank you! Not up my alley at all. However, I would love to hide out in a corner of the shop and see what these nights are like. In addition to this, they also have live music, book club nights, poetry readings, and much more. If you find yourself in San Diego near Seaport Village, please stop by and enjoy this little shop. PreviousTenzi…A Fast, Addictive Dice Game! Who Wants to Play? NextShopkins…What Every Mom Wishes She Had Invented!